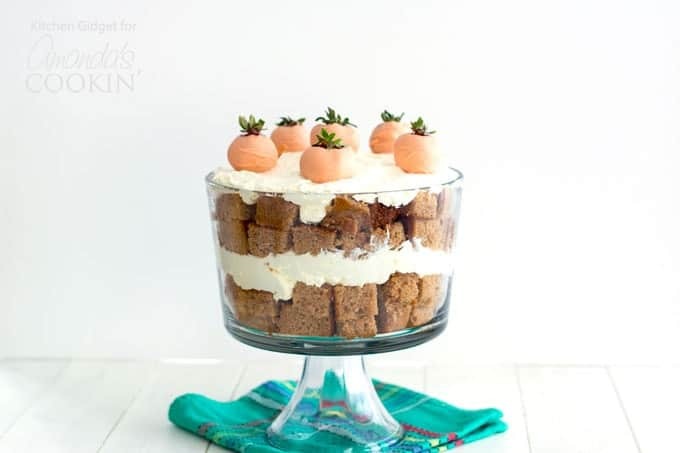 Carrot Cake Trifle: the perfect Easter dessert recipe! Easter is almost here! This is my second most favorite holiday (Christmas being number one). Easter is a particularly joyful celebration of life and, of course, no celebration is complete without food. Baked ham is our protein of choice and a fresh side vegetable such as roasted carrots with feta. We always have plenty of leftover ham at Easter. 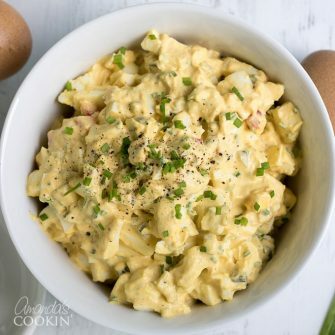 This cheesy ham dinner is one of our favorite ways to use it up. 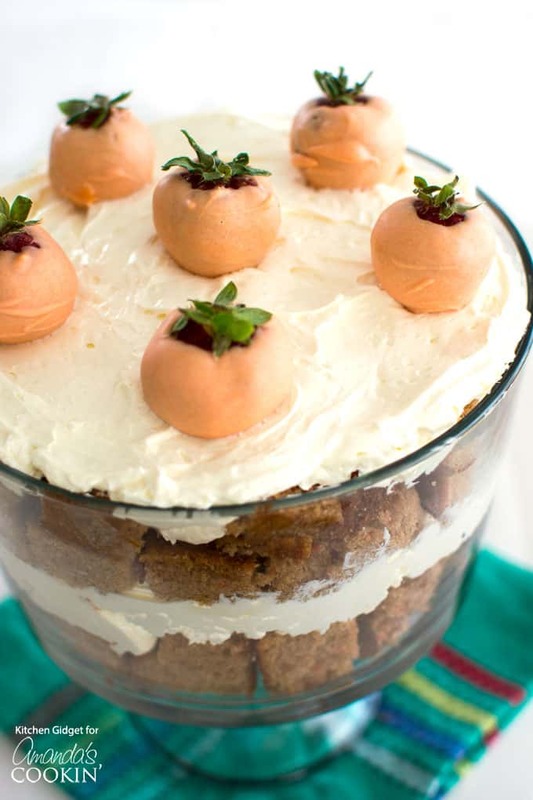 For dessert, serve this impressive carrot cake trifle in a pretty trifle dish. I’m no cake decorator and when I try to make a beautiful cake, they usually result in a “Pinterest fail.” That’s why I love trifles! They’re so easy to make and turn out gorgeous, especially when you serve it in a fancy glass bowl. 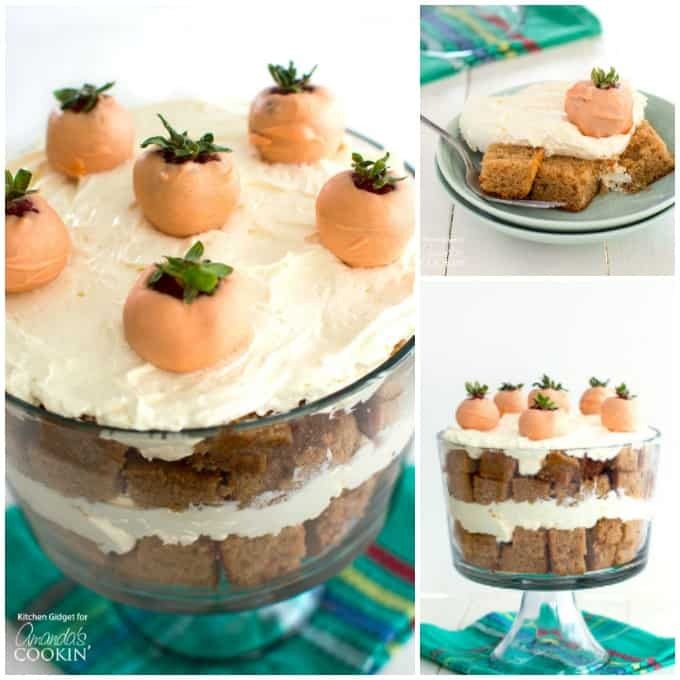 For this carrot cake trifle, I layered chunks of carrot cake with fluffy cream cheese frosting. For decoration, I added some strawberries dipped in orange colored chocolate. They look like cute little carrots and they highlight the flavor of the cake. The filling layers can be made with either whipped topping or heavy cream. I’ve included instructions below for whichever option you prefer best. Heavy cream will give it a looser texture which is ideal for trifles. 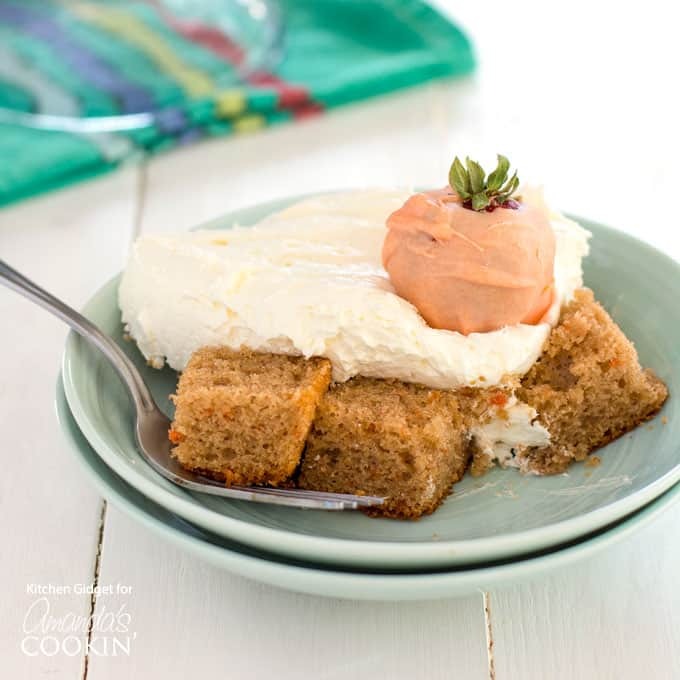 Cool whip will give it a stiffer consistency more like a no-bake cheesecake. If desired, you can create a trifle layer with about 1-2 cups per layer. For example; cake cubes, frosting, walnuts, cake, frosting, raisins, etc. You could even top it with whipped cream! Or, you can use your favorite ingredient as a garnish for the trifle (pineapple rings would be pretty or even shredded carrots). Another option is to place small bowls with these toppings around the trifle and people can add them as they please. If using pineapple, drain well or the trifle will become watery. Easter desserts are always so much fun! Dancing with pretty pastel colors, they’re not only delicious desserts but a treat to our eyes! 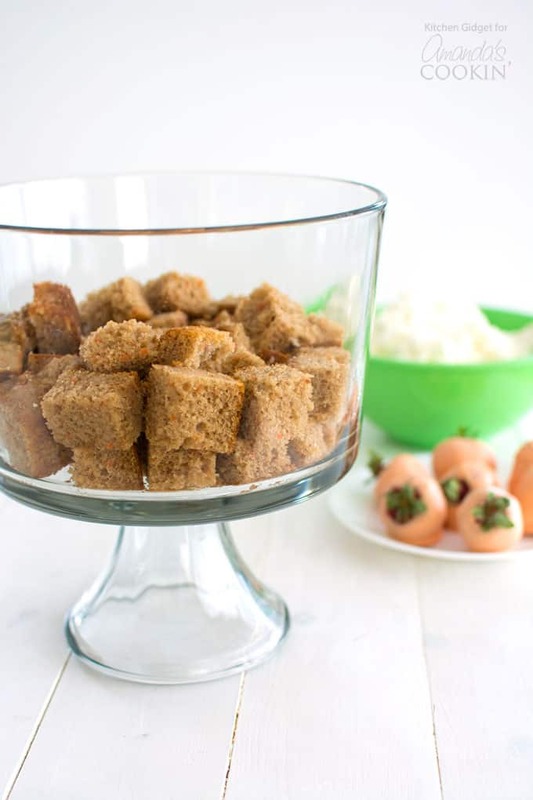 Make sure to check out some of our favorite Easter desserts below! Checkerboard Cake for Easter– this checkerboard cake is full of pretty colors and will WOW your guests! Frosted Sugar Cookie Bars– another colorful dessert are these sugar cookie bars, perfect for spring and Easter! Easter Chick Cupcakes– these adorable cupcakes are so easy, you don’t need to be a skilled baker to make them! Funfetti Marshmallow Cereal Bars– an easy recipe filled with sprinkles to add some fun color! Easter Bunny Cupcakes– bunny cupcakes! Need I explain more? French Silk Pie– this recipe is one that my family makes every year for Easter, Christmas, and Thanksgiving. We love it that much! Rice Krispie Nests– amongst the most popular Easter dessert, these krispie nests are SO cute and make the perfect Easter dessert! 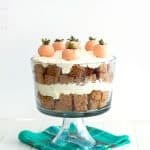 This springtime carrot cake trifle features layers of moist carrot cake and no-bake cheesecake filling. Jazz it up with your favorite carrot cake additions such as walnuts or raisins. This post was originally published on this blog on Mar 3, 2018.